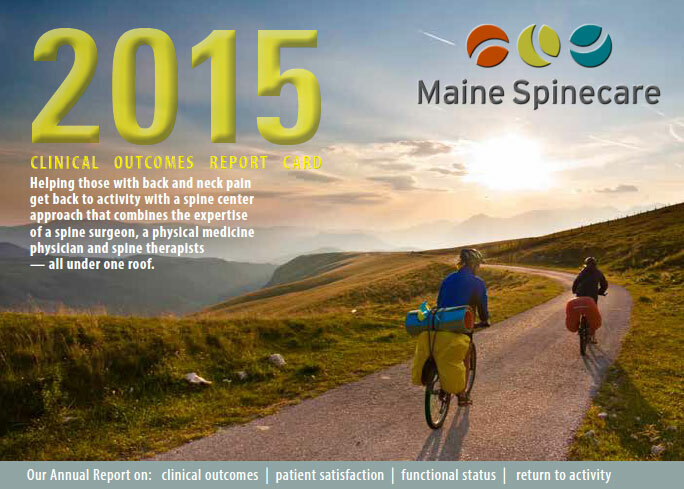 Maine Spinecare, based near Portland, Maine takes a multidisciplinary team approach to back and neck problems to emphasize nonsurgical treatment options for back and neck pain before exploring spine surgery. This new spine center of excellence is a work in progress geared to provide the most advanced spine care to those in Central Maine. The spine center combines the expertise of a fellowship-trained orthopedic spine surgeon, Dr. Michael Regan, along with non-surgical spine specialists, spine-trained physical therapists, X-ray, MRI, an injection suite and an ASC for minimally invasive spine surgery - all under one roof for the convenience of the back pain sufferer. Four out of five Americans will suffer from acute back pain in their lifetimes. Unfortunately, even with the scientific advances in diagnosis and treatment over the last twenty years, the medical treatment that back pain sufferers receive is often ineffective and disorganized. Many patients still experience multiple referrals, excessive diagnostic studies and in some case unnecessary surgeries. Such scenarios leave back pain sufferers frustrated and still in pain. 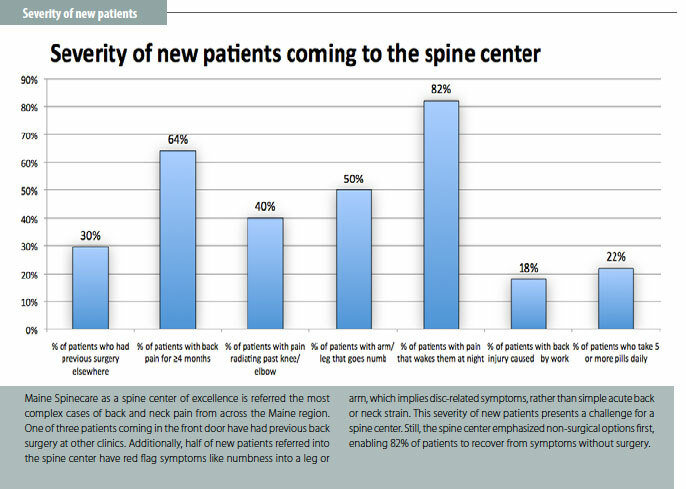 To address these challenges, Central Maine Medical Center, Medical Rehabilitation Associates, and Central Maine Orthopaedics have partnered to establish a regional center of excellence for the treatment of back and neck problems. 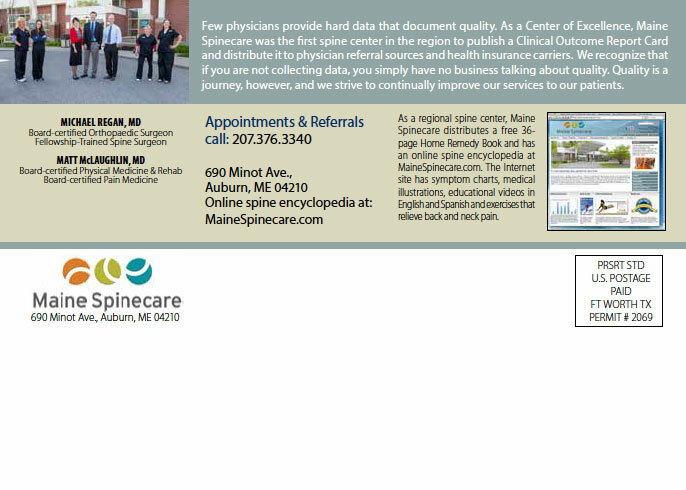 This center is named Maine Spinecare. 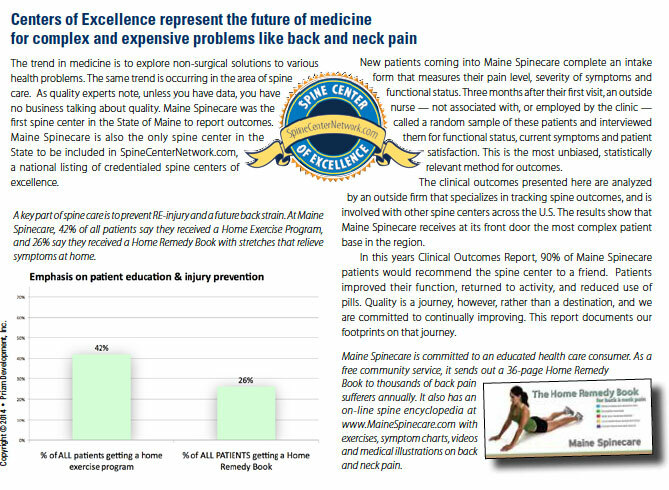 Maine Spinecare combines the expertise of multiple spine care specialists in a single location to maximize care for back pain sufferers. Staffing includes specialty trained physical therapists, physical medicine physicians, and fellowship trained spine surgeons. Emphasis is placed upon directing patients immediately into the correct treatment track to ensure consistent patient management and to resolve back pain as quickly as possible. Care plans are detailed, discussed and developed with each patient, symptoms are documented, and patient responses are thoroughly measured in order to track progress and evaluate any need for change in care management. Experience has shown that 80 percent of back pain sufferers benefit from conservative treatment that includes a thorough patient education program, a dedicated physical therapy program designed precisely for back pain problems. 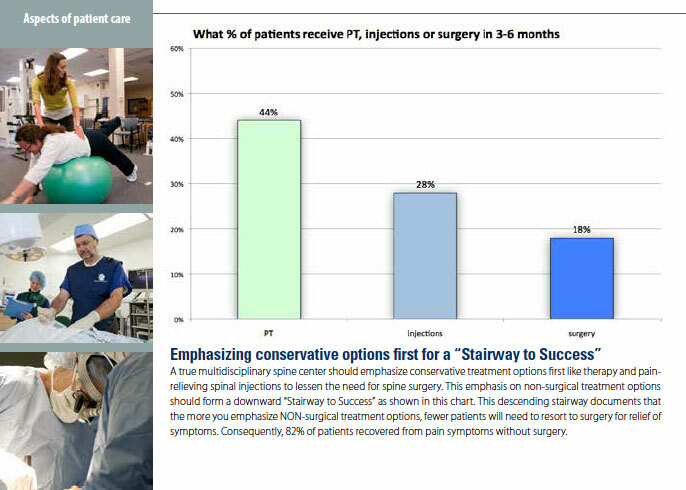 Another 10 to 15 percent of back pain patients may need injection therapy, and approximately 5 to 10 percent may need a surgical intervention. 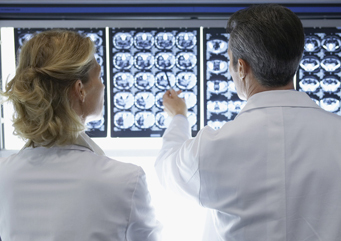 Surgery may be the best option for some spine problems or may be necessary when symptoms of radiating pain have not responded to non-surgical treatment options. In addition, for some patients who may experience weakness or numbness in the extremities or loss of bowel and bladder control surgery could be the correct option. For many of these patients the latest procedures, which often utilize minimally invasive techniques and same day surgery, are appropriate for resolution of the clinical problem. Fortunately, patients who require surgical management can have an immediate consultation with Maine Spinecare’s fellowship trained surgeons. 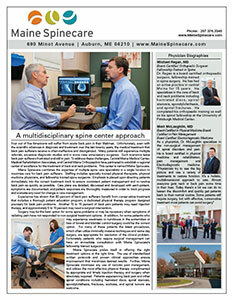 Maine Spinecare prides itself in offering the right treatment options at the right time. The use of standardized written protocols and proven clinical approaches ensure improvement that maximizes desired results. 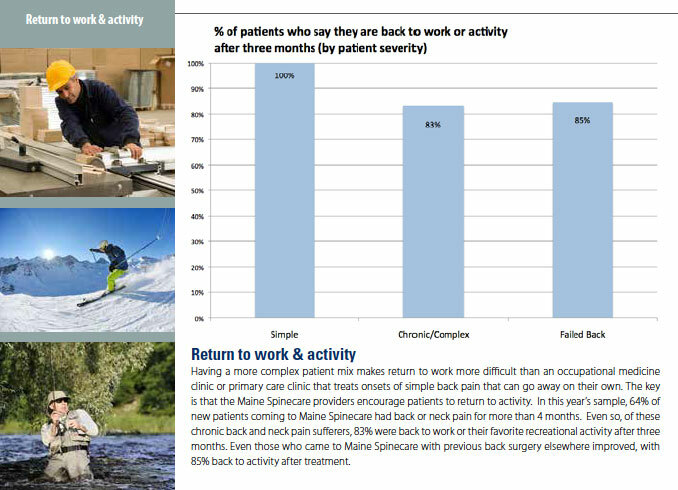 Further, Maine Spinecare minimizes any use of narcotic pain management, and utilizes the most effective physical therapy complimented by appropriate and timely injection therapy, and surgery when absolutely required. Patients experiencing back pain and other spinal conditions including herniated discs, spinal stenosis, spondylolisthesis, fractures, scoliosis, and spinal tumors are welcome. The main reason people go to the doctor is for relief of pain. But if a spine physician focuses exclusively on pain, he can miss the target of return to function. For example, spine specialized therapists move the patient quickly into exercise. 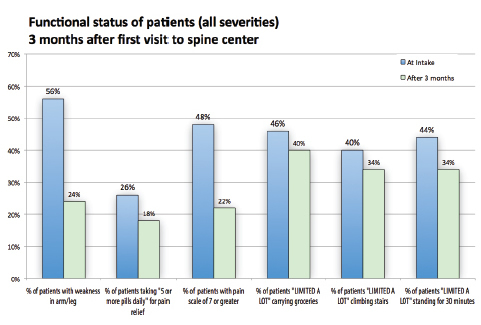 At intake, 48% of patients rated their pain level at 7 or more on a 1-10 analog pain scale. After three months, it improved to only 22%. 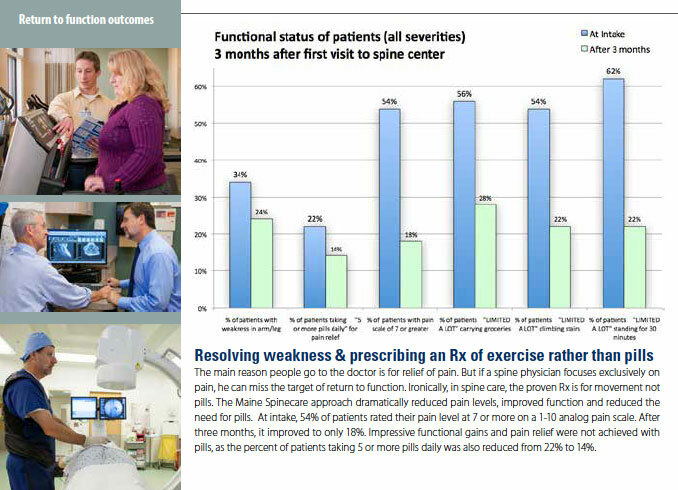 Gains were not achieved with pills, as the percent of patients taking 5 or more pills daily was also reduced. The percent of patients with neurological issues improved as well as functional status scores pre and post treatment.